GRS 1915+105 is a system containing a black hole about 14 times the Sun's mass in orbit with a companion star. Researchers monitored this system with Chandra and RXTE for over eight hours and saw that it pulses in X-ray light every 50 seconds in a pattern similar to an electrocardiogram of a human heart. The X-ray pulses are generated by changes in the flow of material falling toward the black hole. This optical and infrared image from the Digitized Sky Survey shows the crowded field around the binary system GRS 1915+105 (GRS 1915 for short) located near the plane of our Galaxy. 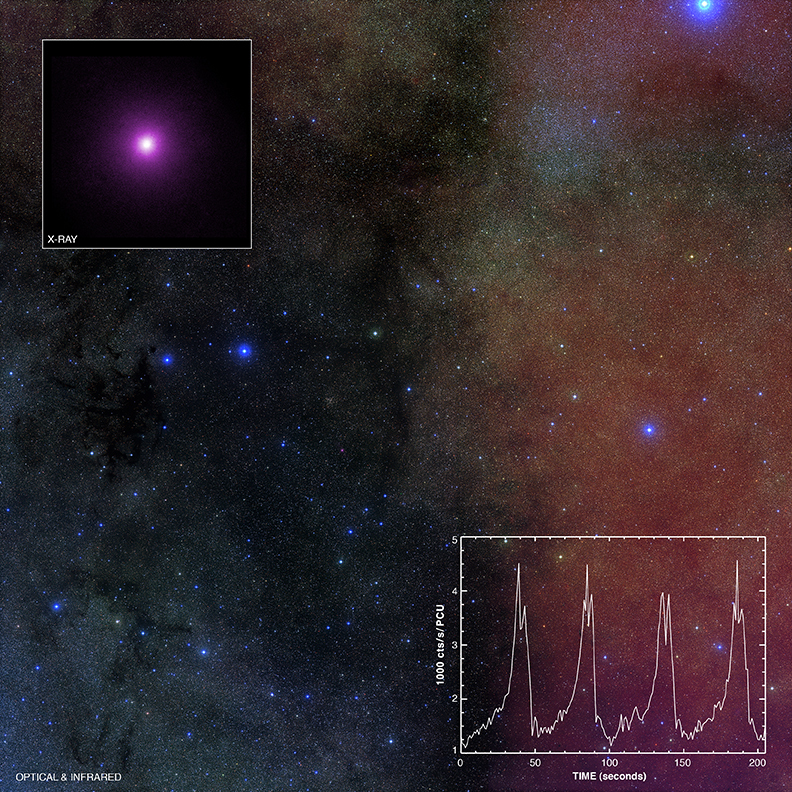 The top-left inset shows a close-up of the Chandra image of GRS 1915 , and the bottom-right inset shows the remarkable "heartbeats" seen in the X-ray light from this system. Using Chandra and the Rossi X-ray Timing Explorer (RXTE), astronomers have discovered what drives these heartbeats and given new insight into the ways that black holes can regulate their intake and severely curtail their growth. GRS 1915 contains a black hole about 14 times the mass of the Sun that is feeding off material from a nearby companion star. As the material swirls toward the black hole, a disk forms. The black hole in GRS 1915 has been estimated to rotate at the maximum possible rate, allowing material in the inner disk to orbit very close to the black hole -- at a radius only 20% larger than the event horizon -- where the material travels at 50% the speed of light. Researchers monitored this black hole system with Chandra and RXTE over a period of eight hours. As they watched, GRS 1915 gave off a short, bright pulse of X-ray light approximately every 50 seconds. This type of rhythmic cycle closely resembles an electrocardiogram of a human heart -- though at a slower pace. It was previously known that GRS 1915 can develop such heartbeats, but researchers gained new understanding into what drives the beats, and used the pulses to figure out what controls how much material the black hole consumes from the RXTE data. The astronomers also used Chandra's high-resolution spectrograph to study the effects of this heartbeat variation on regions of the disk very far from the black hole, at distances of about 100,000 to a million times the radius of the event horizon. By analyzing the Chandra spectrum, they found a very strong wind being driven away from the outer parts of the disk. The rate of mass expelled in this wind is remarkably high, as much as 25 times the maximum rate at which matter falls onto the black hole. 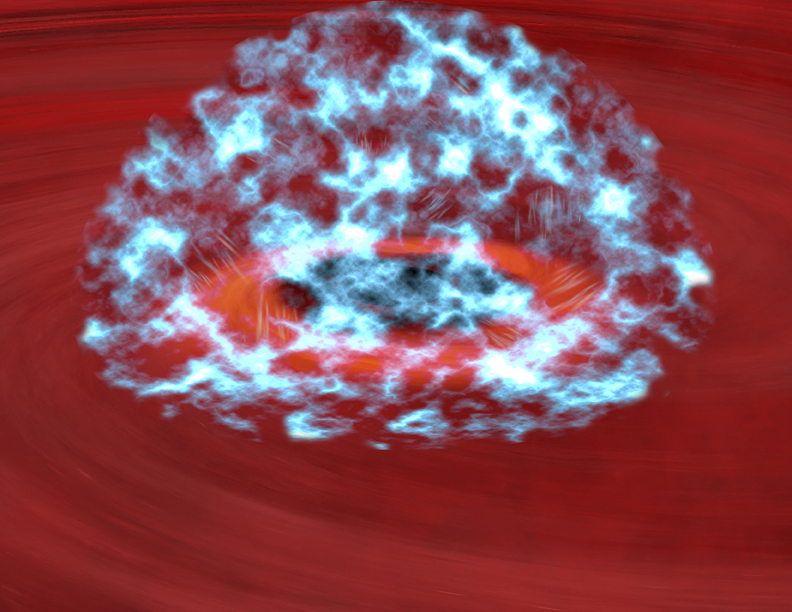 This massive wind drains material from the outer disk and eventually causes the heartbeat variation to shut down. Coordinates (J2000) RA 19h 15m 11.60s | Dec +10° 56´ 44.00"
Adil, the nomenclature is as follows GRS stands for GRANAT source GRANAT is an earth orbiting observation platform from which the GRS 1915 105 was discovered, 1915 is the right ascension and 105 is declination. The X-Ray source is a binary system composed of black hole and a star in common orbit, almost halfway across our galaxy. It emits X-Rays in a regular pattern, caused by the black hole accelerating matter drawn from the star. Always good to see discoveries such as this pushing the boundaries of scientific knowledge, but if my ECG looked that that, I'd ask a team to stand by with a defibrillator. Such analogy seems to make people draw odd conclusions. I love periodicity. Resonances of harmonic action from collision. I do not believe in all my reading about these objects I ever ran across pulsating black holes. I have read so much maybe I have just forgotten, but all the same very educational as usual, something new learned. I have a question for you Les, what do you mean by a living being? I would like to know what your thoughts on this is not to be arguing with you. Very interesting notion. Adil, GRS stands for Gamma Ray Source. Given that it is a compact object measuring as much as 14 times the mass of the Sun, astronomers suspect that it is a black hole. Is it just a "heartbeat" that makes one think of life? I see a visual connection to life when looking at the universe. As in microscopic sea life forms. Patrick, In the absence of any other forces, a black hole that isn't feeding off another star would keep spinning more or less forever. Stephen Hawking predicted that black holes should evaporate very "slowly". For a black hole like GRS 1915+105 this evaporation will take trillions and trillions and trillions of times longer than the current age of the universe. So basically, isolated, inactive black holes just sit there forever. Also of interest, the fact that there is not just an intake of material, but that at the rim of the disc there are winds expelling matter outwards. But my real question is, what happens when the work of a Black Hole finishes? I mean what does a Black Hole turn to, once it has exhausted its activity? We know that at the core there is solidified matter that swirls at incredible speeds, does it just stop? What actually is this GRS 1915? Appears that the term "Universe" needs to be rethought as new data leads one to believe that we exist within a living being. A binary system located near the plane of our Galaxy. 40,000 light years from Earth. Using Chandra and the Rossi X-ray Timing Explorer (RXTE). X-rays are violet and the optical data are red, green, blue. In the constellation Aquila, visible from Northern Hemisphere. Simulation of GRS 1915's "Heartbeat"